Petit Byahaut, on the lush, frangipani-scented west coast of St. Vincent, has no swimming pools, no televisions, no telephones, no tennis, no minibars and no flags to raise when you want a drink brought to you in your hammock. The guesthouses are corrugated-roofed open-air decks with screened-in areas for bedrooms. Vacationers may share their living space with scurrying little black ants — in a resort where a can of Raid would be about as welcome as Hurricane Ivan, insects happen. But what's striking about staying in Petit Byahaut, a fiercely determined environmentally sensitive resort, is what you don't have to give up. Judith Jackson Spa citresse soap and Aromae Botanicals shampoo for the shower, for example. Fresh flowers left on the bed every day by the woman who changes the sheets. Guided snorkeling through a cave. Rum punch made with fresh-squeezed guava juice at sunset. Grilled dorado. Squid stuffed with scallops and shrimp. Petit Byahaut (pronounced PUH-tee BYE-ah-hah) is one of a generation of so-called eco-resorts that have grown up, offering not only environmental bragging rights but also creature comforts like well-appointed bathrooms and chef-prepared meals. Even for travelers who haven't much worried about whether their presence on a tropical island might contribute to the paving of paradise, these places can be alluring, presenting an uncrowded, relatively unspoiled face of the islands. "We get boaters here all the time who don't know we're a hotel," said Brian Durbin, who with his wife, Nicole, manages Petit Byahaut. No wonder. The place is almost invisible from the sea, its steep green hills meeting the Caribbean at a small black sand beach, its five guesthouses hidden among trees and spread out inland on the resort's 56 acres. No international standards define an eco-resort, but places that describe themselves as sensitive to nature generally share two characteristics: resource conservation and minimal interference with the natural setting. Solar power, composting, careful waste-handling and projects benefiting indigenous communities are common themes. Petit Byahaut does not disturb the native forest with roads. Guests are brought in by boat (about a 10-minute ride) to an offshore mooring and transferred to an eight-foot dinghy before landing at the dockless beach and wading to shore. All of Petit Byahaut's supplies arrive in that fashion, as did all of the materials brought in by Charles Meistrell, the Californian who opened Petit Byahaut in 1991, to build it — every nail, bag of cement and propane tank. The guest dwellings have low-wattage lights powered by photovoltaic cells on their roofs. When it rains, the metal roofs funnel water to discreetly sited tanks, from which it is piped to the guests' solar-heated showers and filtered for drinking. Toilets are connected to a septic system, and showers and sinks simply drain into planting areas. The tiny black ants venture in from the surrounding woods because pesticides could end up in the coral-studded cove out front. Other eco-resorts operate in similar fashion. Tiamo Resort, on South Andros Island in the Bahamas, offers beachfront cottages among palms and sea grape trees surrounded by a 125-acre nature preserve accessible only by a three-mile boat ride. A half-acre array of photovoltaic cells provide the electricity for the resort. Mike and Petagay Hartman, who own Tiamo, are particularly proud that the land for the resort, built in 2000, was cleared by hand, using machetes and chain saws, to limit damage to the vegetation. Lapa Rios, a full-service resort on the isolated Orsa Peninsula on the Pacific coast of Costa Rica, not only uses solar power and battles bugs with mosquito nets instead of sprays but it has also has refused to heed local law calling for cutting through "monkey bridges" over roads through the rain forest. And 3 Rivers, in the mountains of Dominica, boasts a long list of environmentally sensitive practices, from solar power and composting to running its diesel truck on used vegetable oil. Yet all of these places also manage to provide enough luxury to attract fairly demanding vacationers. The island environment itself helps. A solar outdoor shower might not be as reliably hot as one fed from a conventional water heater, but in an open-air setting under a warm sun, amid scents of calabash and guava trees, it's relaxing and exotic. Petit Byahaut's dining room is merely a covered deck, but iridescent hummingbirds feed at flowering bushes next to the tables. ON a trip to Petit Byahaut last year, my wife and I kayaked along the St. Vincent coast and snorkeled over coral-studded rocks a few feet off the beach, undisturbed by other tourists trying to do the same. We hiked trails to panoramic views and to an ancient Cariban oven carved into a boulder. We also sipped cocktails on a little docklike deck with benches that extended just over the surf — waves would get our legs wet as we watched the sunset. And we shared dinners prepared by Mr. Durbin, once a chef at Carmine's on Penn in Denver, or by Chuckie Taylor, the main chef, with visiting sailors, some of whom had come across the Atlantic in their boats. Appetizers included callaloo and pumpkin soups, ham and potato cake, and fried calamari; entrees, many of them fresh fish dishes like wahoo wrapped in banana leaves that we had seen Gideon Pompey, Byahaut's boatman, cutting, were all first rate. Later, there was stargazing or a little reading before sleep. This could get boring, we decided, after a few decades. At Lapa Rios, the main attraction is the beauty of 1,000 acres of virtually unspoiled rain forest — waterfalls, exotic native animals and extravagant vegetation — its preservation supported by the resort. 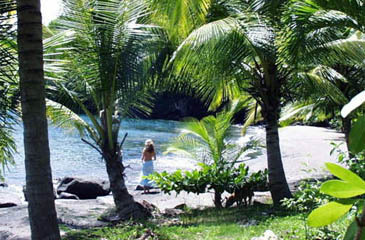 But guests not fascinated by the hiking can surf, ride horses, fish (catch and release) or indulge in yoga and massage. The resort is proud enough of its food to sell its own cookbook. In the Bahamas, Tiamo invites guests to leave their private beach bungalows, with their king-size beds and open-air rock-floored showers, to go bonefishing, snorkeling, sailing or kayaking. Even the relatively rustic 3 Rivers offers Internet access, locally made (and biodegradable) toiletries and soaps that work well with the island's soft water, and Chinese massage — perhaps more a necessity than a luxury for guests who attempt some of the island's spectacular and spectacularly challenging hikes. While staying at Petit Byahaut, we made a day trip to Bequia (pronounced BECK-way), the largest of the Grenadines, to see Moonhole, an amazing residential community where some houses, with professional cooks and other staff, can be rented by the week. It is a quirky 19-home ecologically oriented development built of native stone, with whalebone accents, on the steep hills of the island's southern tip. The name comes from a soaring natural arch on the shore through which the moon can be seen at times. The whalebones, remnants of the minimal whaling by the islanders, are big enough to work as elements like stair railings. The houses, which rely on solar electricity, rainwater and propane tanks, are mostly fanciful open-air affairs with lines blurred between indoors and out. Floors slope so that rainwater can flow to cisterns and the gardens — it can flow in because windows tend to have neither glass nor shutters. Most of the seating is built-in stone benches topped with cushions (remember the "sofa" on "The Flintstones")? Steep stairways link the houses, which appear to have sprouted from the rocky landscape. "People think they're old ruins," said Jim Johnston, whose father, Tom, a Chicago advertising executive, began developing the site in the 1960's. "But they just look that way." The community, which evokes Frank Lloyd Wright's Fallingwater as well as Gaudí's Park Guell in Barcelona, fronts a white sand beach with dreamy turquoise water on one side and overlooks a cliff-edged bay popular with divers on the other. A homeowner at Moonhole needs dedication to the concept of an environmentally sensitive paradise. But visitors at these well-appointed eco-resorts have some choice about how much of their vacation time they want to spend actively supporting the cause. Guests who feel too weary to hike in the forest or to absorb rain-forest ecology lessons are free to spend their time lounging at the beach and sipping something cold, enjoying the pristine landscapes from the comfort of hammocks. And they can always leave with a souvenir. Tiamo offers one of the most appropriate. Guests are invited to depart carrying packages of used plastic food containers (one of the few products the resort can't figure out how to reuse), suitable for dropping into the municipal recycling boxes back home. 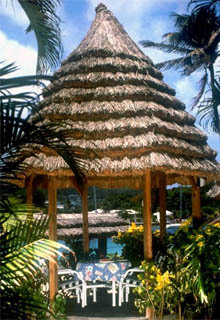 Petit Byahaut, Kingston, St. Vincent, West Indies, (784) 457-7008, www.petitbyahaut.com, four miles north of town, can house 10 guests in four bungalows and a tent on 56 acres. The double-occupancy rates are $140 a night a person in high season, Nov. 1 to May 14, then $112 to Aug. 31; it closes in September and October. All meals, but not bar drinks, are included, as is the use of kayaks and snorkeling gear. 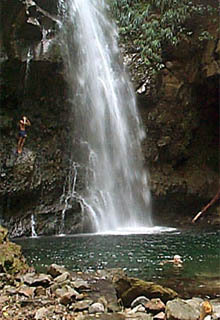 Scuba equipment can be rented and hiking or boating excursions arranged. There is a three-night minimum and a 17 percent tax and service charge. 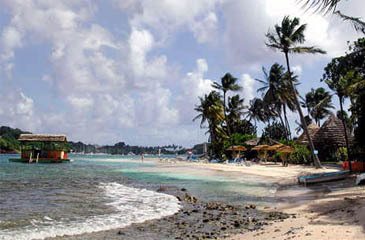 Flights go through Barbados, St. Lucia and Grenada. Tiamo Resort, General Delivery, South Andros Island, Bahamas, (242) 357-2489, fax (305) 768-7707, www.tiamoresorts.com, has 11 bungalows for 22 guests (they urge not taking children under 12). Through Dec. 20, rates are $275 a person a night, including all meals, use of kayaks, sailboats and snorkeling equipment, and many guided activities. Bar drinks and 6 percent tax are extra. Closed August and September. Flights are available to South Andros from Nassau or Fort Lauderdale, Fla.
Lapa Rios, Post Office Box 025216-SJO706, Miami, Fla. 33102; (506) 735-5130, fax (506) 735-5179; www.laparios.com, is south of Puerto Jiménez on the Orsa Peninsula of Costa Rica. It has 16 bungalows for up to four guests each. Rates are $172 to $260 a night a person, double occupancy, including taxes and all meals. The hotel can arrange flights from the capital, San José. 3 Rivers Eco Lodge, Post Office Box 1292, Newfoundland Estate, Rosalie, Dominica; (767) 446-1886, fax (270) 517-4588; and www.3riversdominica.com, has three cottages, sleeping three, for $70 a night; a very secluded thatched house and a bamboo tree house, both for two, for $40 and $50; and a four-bed dormitory-style cabin for $25 a person. Camp sites go for $15 a night, with tents renting for $15 or $20; and a hammock in a shelter is $18 a night. American Airlines (from Puerto Rico) and other regional carriers fly into Dominica. 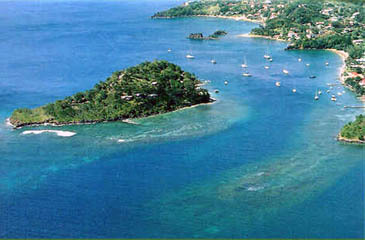 At www.3riversdominica.com on Bequia, St. Vincent and the Grenadines, a three-bedroom house is offered by Jim and Sheena Johnston, (784)458-3068, www.begos.com/bequiamoonhole, for $1,200 a week for four and $150 each additional person. It comes with a staff of two, including a cook; guests provide groceries. Another Moonhole owner, (784) 531-7082 , www.burke-house.com, rents two houses. 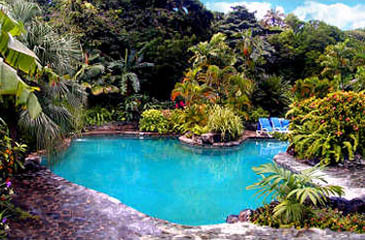 Burke House has two bedrooms with staff for $1,275 a week, and packages with air fare and diving can be added. The second, Tranquility Villa, has four bedrooms, a pool, five terraces and 300-degree water views for $4,999 a week. 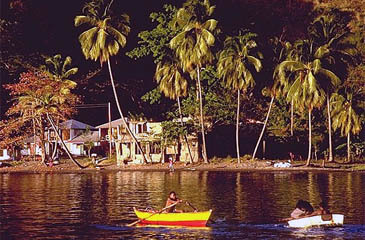 Like St. Vincent, Bequia is most easily reached by flights from Barbados. 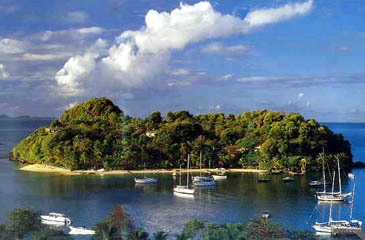 Its harbor at Port Elizabeth, about four miles from the homes but a 25-minute drive, is served by several ferries a day from Kingston on St. Vincent.